Spotted at the Barneys Warehouse Sale! I wonder what Mrs. Marcos would think about that! Judging by the scene at the shoe section, I would say this is still pretty tame. Customers still get to try on shoes while sitting down. 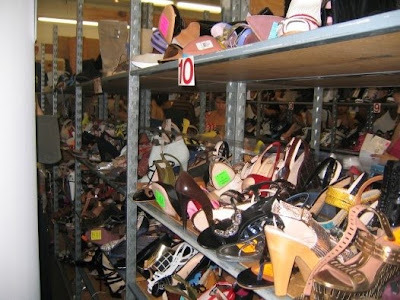 I've been to Barneys warehouse sales and everyone would try on shoes right there in front of the racks! I've had better luck shopping the Barneys shoe sales right on Madison! Because by the time the warehouse sale rolls around, these are all that's left...You see anything you like? when are you posting berry's heelarious heels from tita mawee? !